Social media and app support: SMS, Whatsapp, Facebook, Twitter, Gmail, Email, Real-Time Weather, QQ, Wechat, and much more. It also has a remote video and remote camera recording ability where it can record high-definition videos and also supports cell phone cameras. It can transform your voice into a female voice, male voice, elderly voice, a child’s voice, and others. Supports all Bluetooth 4.0, Nucleus, IOS 7 and above or Android 4.3 and above smartphones. DIGITAL CROWN CONTROL: You can use the digital crown to scroll through lists, zoom in and out, and control the intelligent interface. GRAVITY SENSOR: By raising your hand it will wake the screen. When you flip your hand it can switch between features. 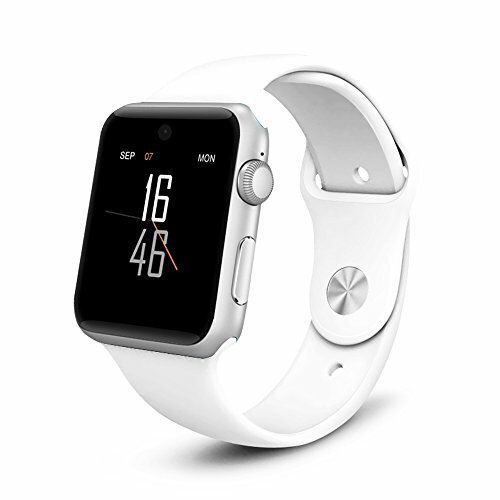 AMAZING FEATURES: Includes a fitness tracker, sleep monitor, remote camera, sedentary reminder, music player, calendar, calculator, alarm clock and video recorder to give the ultimate smartwatch experience.